Global Nitrile Butadiene Rubber (NBR) Powder Market size was estimated over USD 350 million in 2016 and will exhibit growth of over 6.5% up to 2024. NBR powder market is strongly driven by the applications in frictional compounds to increase the abrasion coefficient. Frictional materials include brake liners, clutch plates, resin wheels, disc pads among others used in the automotive sector. According to OICA, the global new vehicle sales in 2017 accounted for over 96 million, of which, the U.S., China, and Japan accounted for over 17.5 million, 29 million, and 5 million respectively. Growing demand of vehicles in developing countries such as China, India and Brazil; as well as slow but steady demand in developed countries such as U.S. and Japan will drive the nitrile rubber powder market. Additionally, rising demand for frictional materials from the railway sector to make heavy duty railway blocks is likely to increase demand for NBR powder market especially in of India, Malaysia & Thailand. Increasing usage of thermoplastic elastomers & thermoplastic olefins (TPE & TPO) as substitutes for NBR powder will result in a sluggish growth for the market. This is due to several factors such as cost-effective pricing of substitute products, along with enhanced physical and mechanical properties which result in differential modification results. Considering the particle size, nitrile rubber powder market is segmented into less than 0.075 mm, 0.075 – 0.15 mm, 0.15 – 0.30 mm, 0.30 – 0.70 mm, 0.70 – 1.00 mm. These powder particle sizes vary according to their uses and are measured as per its diameter. Industry producers initially provided NBR crumb forms, which went up to 6 mm in size. However, with advanced grinding processes and technologies developed in the past few year, manufacturing of micron particle size powder is possible. The 0.30 – 0.70 mm diameter segment held the maximum share of close to 60% in the global NBR powder market. Industrial acceptance of sizes for a maximum of 1 mm powder particle led to growth in the 0.70 – 1.00 mm segment. The segment is said to grow at a highest CAGR of over 7% in the global NBR powder market. Global nitrile rubber powder market consists of three major grades considered in the report, namely, pre-cross linked, cross linked, and linear. Pre-cross-linked powder finds usage in PVC modification as it blends to improve the impact resistance as well as low temperature flexibility. Moreover, it also helps in lesser fogging and lowers abrasion and wear. The segment is said to grow at a considerable CAGR of over 5% in the forecast period. The North America cross linked segment was valued over USD 20 million and is said to exhibit growth with a highest CAGR close to 6.5%. This trend is due to massive automotive industry in this region led by the U.S, as the country constitutes for close to 90% vehicles in the North American region. According to OICA, sale of new vehicles in the U.S. was recorded over 17.5 million in 2017. 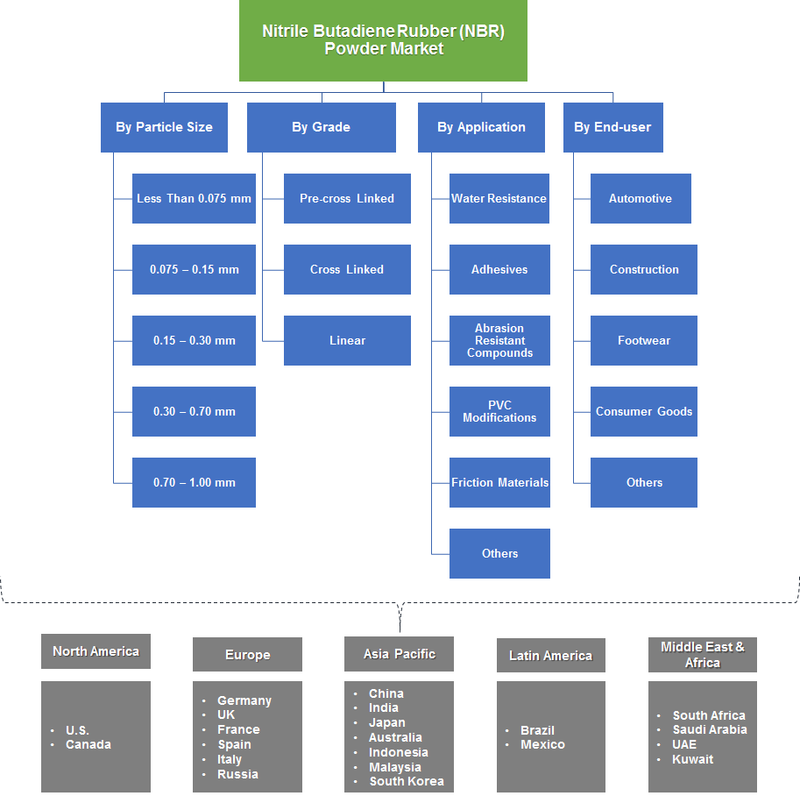 Water resistant products, adhesives, abrasion resistant compounds, PVC modifications, and friction materials are the major applications of NBR powder market. The others segment includes minor categories such as stator applications. NBR powder finds major usage in applications which require long-duration of water exposure. This segment is said to exhibit considerable growth till the end of the forecast period and was valued close to USD 45 million in 2016. PVC modification is one of the major applications of NBR powder and captured a huge industry share of around 45%. The product acts as a transformer in PVC modification by providing low temperature flexibility, chemical and impact resistance, and enhanced mechanical properties. PVC modifications segment held a market share of close to USD 75 million in 2016. Industrial growth and developments in the Asia Pacific will drive the segment to new heights in the region. NBR powder market has been segmented on basis of various end-user industries such as automotive, construction, footwear, consumer goods, and others which includes tubes, coatings, etc. Substantial growth in the automotive and related industries, especially in the developing countries around the world, is said to foster the NBR powder market in the forecast period. Automotive sector in China and India is growing hugely owing to increasing purchasing power parity of consumers. Automotive segment will prosper in India with the highest rate amongst all the other end-user industries. In 2016, the segment accounted for over 55% market share in the India nitrile rubber powder market. Asia Pacific is the fastest growing region in the global NBR powder market owing to vast number of industries present in the region. The segment held a market share close to USD 165 million in 2016 and is said to exhibit growth at the highest rate because of the fast-developing countries such as China, South Korea, and India. Europe will exhibit growth at comparatively lower rate than Asia Pacific owing to the economic slowdown in this region. The region is led by countries such as Germany and UK which collectively accounted for close to 35% share in the global NBR powder market. Prominent players operating in the NBR powder market are Lanxess, Zeon Chemicals, Nitriflex, Omnova Solutions, Taprath Polymers, and LG Chem and others. Lanxess is one of the giant player in the nitrile rubber powder market with its NBR centric research and development facility located in France. Few years ago, the company relocated all its production facility of nitrile rubber from Germany to France, to make it the world’s largest NBR production site. The company believes to capture a major market share by developing NBR powder by its sophisticated technology for various industries. 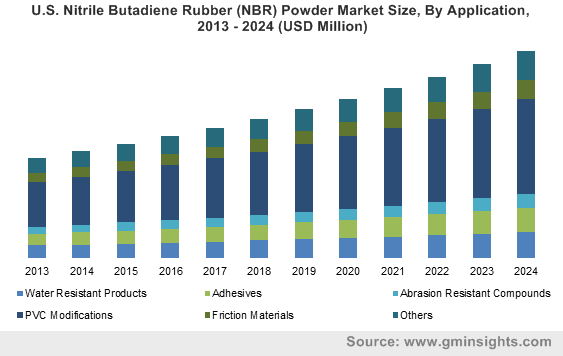 Nitrile rubber powder market is estimated to grow at a considerable rate due to its varied applications as a modifier in strength modification of friction materials, brake pads, and other such constituents. The product finds wide use in performance improvements for rubber product processing, resin modifications, etc. The market is said to be oligopolistic in nature with the presence of a limited number of large market players.